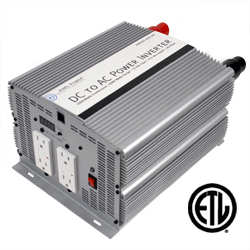 This 3000 Watt Inverter is ETL listed, has 4 GFCI outlets and a 12VDC input. Battery terminals are designed to conduct more current therefore, only needing one set of cables. Bolt down style. Continuous output power: 3000 Watts. Use our 300 amp inline fuse.